Smarter.CMO will help construction managers save time, improve quality and earn value across your construction programme. Data is easily incorporated from multiple systems enabling a consolidated view over the entire CMO. Verified and approved monthly actuals and forecasts can be output for upload to your cost and planning systems. Risk & Opportunity and Change Management data combined with the EVM data will help you make the right operational decisions to ensure successful programme delivery. Add revenue data to accurately forecast and monitor cash flow, raising stakeholder confidence in your control. Project, cost, risk and change managers can get days per month savings in reporting effort allowing them to use their skills and experience to drive project delivery and profitability secure in the knowledge that their project intelligence is always right. 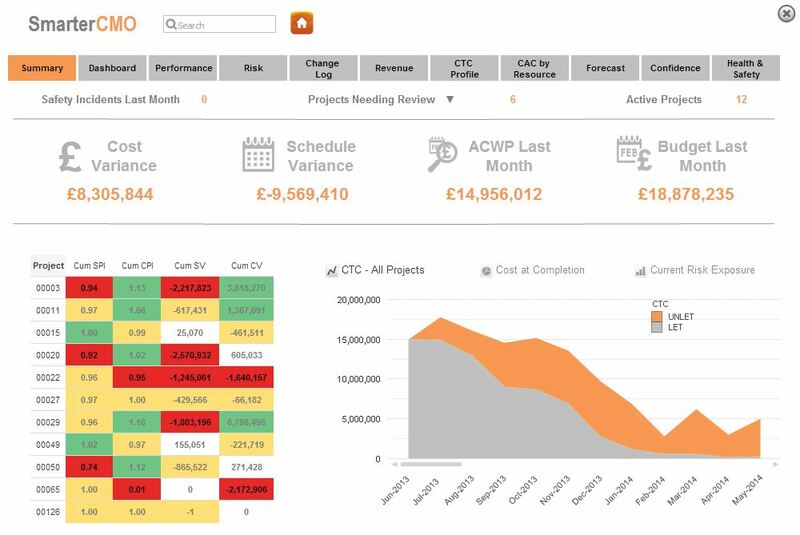 With full up to date visibility of all your programme data combined with commentaries for project change and performance, future programme boards can focus on the real decisions with confidence that the programme is being managed effectively. Smarter.CMO Dashboard Application solution for programme and project managers to address their need to report from dial to detail on a timely basis. Supported by a Self-Service BI data centric QlikView and Qlik Sense architecture. Offering accelerated time-to-report, time-to-decide, and time-to-value. Delivering operational excellence and competitive advantage to our clients. 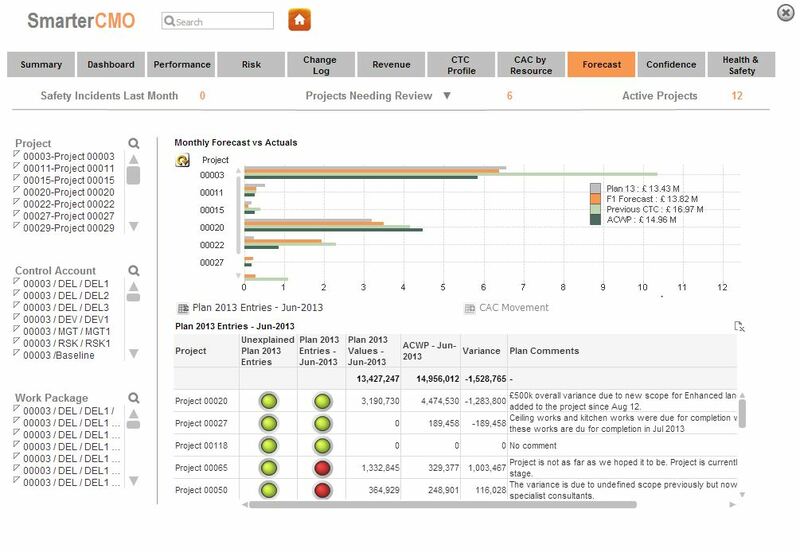 Smarter.CMO provides accurate and real-time information in order to drive effective construction project management. 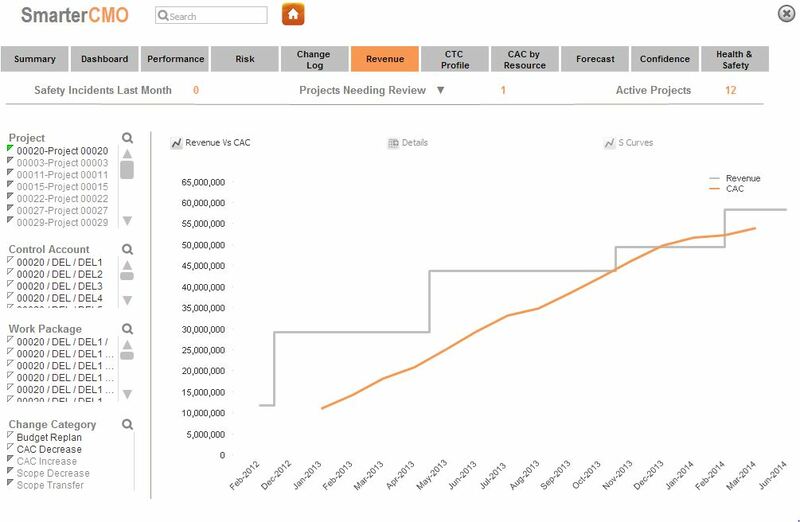 The analytics provides users with the ability to analyse progress and make well-informed decisions on an organisations entire construction project profile. The dashboards provide visual analytics with real-time information, which are easy to read and understand. Typically, these dashboards are built to deliver insight and business intelligence so projects meet business goals. Conventionally, these area accomplished with quarterly or annual reports which can be extremely consuming and can negatively impact the business. Smarter.CMO provides a solution that allows users to see the whole story within their data, and spot trends early enough to anticipate any changes in projects. Create dashboards through drag and drop functionality. The QlikView Smarter.CMO reporting application puts all of our project information in one place and has cut more than a weeks effort per month from our reporting cycle. The greatest benefits though are having integrated information across all project disciplines enabling us to quickly identify opportunities and issues and providing package level insight in minutes as opposed to days. Differentia Consulting delivered this enterprise ready solution in less than one tenth of the time of a comparable BI offering meaning we anticipate full ROI in under three months. Grimmond, Programme Controls Lead, Mott MacDonald Ltd.
Primavera, Artemis, Cobra, Pertmaster, Oracle Finance, SAP, JD Edwards.